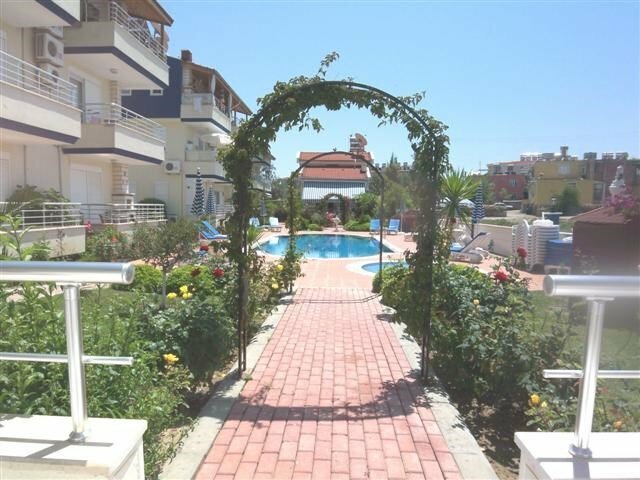 The villa is close to shops, bars and restaurants and a 15 min walk from old Side and the beach. It has a lovely terrace, balcony, garden, built-in barbecue with chimney and parking on the road. The villa has a large open plan lounge/ kitchen, with hob, oven, extractor, fridge/ freezer and washing machine. It has a lovely terrace with it's own patio table and there is a built-in BBQ and chimney. A short journey to the centre of Side and the busy shopping area of Kumkoy. The development consists of 12 units, surrounding a large shared pool with jucuzzi and beautiful well tended gardens. Side is a small town on the southern coast of Turkey. It is one of the most well-known ancient towns in the country. Side sits upon a small peninsula that is only about 800m in length, providing some spectacular views across the Mediterranean Sea. Having a typical Mediterranean climate means that Side plays host to long hot summers and short mild winters. Summer sees average highs reach into the 30’s, and it’s not uncommon to have several days in a row in excess of 40°C in the peak of summer. Another factor making Side a great place to visit year round is its amazing ruins. Side was once a port and ruins of the ancient city are scattered amongst the modern-day architecture. So you can soak up the sun, swim in the crystal waters of the Mediterranean Sea or spend you days taking in ancient history! Side is about 60km from Antalya airport and the transfer takes about 45 mins. The transfer can be arranged on application.